Roger Stone, the Republican political operative who boasted of a close friendship with President Richard Nixon and shares one now with President Donald Trump, said that a recent report that he had been in contact with Guccifer 2.0 is an "absurd claim." Stone reached out to Salon by email to offer his side of the story about a recent report by The Smoking Gun. The article claimed that he had been in contact with Guccifer 2.0, an online hacker American officials believe is operated by Russian military intelligence. "This is another absurd media claim that is part of the long-standing absurd media claim the Donald Trump had anything to do with the Russians," Stone told Salon in a pair of emails, one from his personal account and the other (at Salon's request) from his professional account. "This is a charge without a shred of evidence." He added, "I myself had no contacts or communications with the Russian State, Russian Intelligence or anyone fronting for them or acting as intermediaries for them. None. Nada. Zilch. I am not in touch with any Russians, don't have a Russian girlfriend, don't like Russian dressing and have stopped drinking Russian Vodka." The New York Times claimed in January that it had spoken with intelligence sources who said they possessed emails, financial records and intercepted phone call transcripts that proved the Trump campaign had colluded with Russia, but Stone is denying the allegations. "I challenge them to produce said 'proof,'" Stone said. Most notably, Stone challenged the veracity of The Smoking Gun's story, arguing that the site that "is neither hot or smoking on this one. Their sequence of events is wrong." 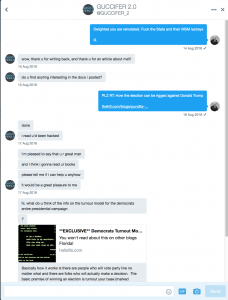 "All contact I had with the entity known as Gufficer 2 came after I had written an article that was published Aug. 5, 2015 by Breitbart News and vetted by their lead investigative reporter Lee Stranahan," Stone said. 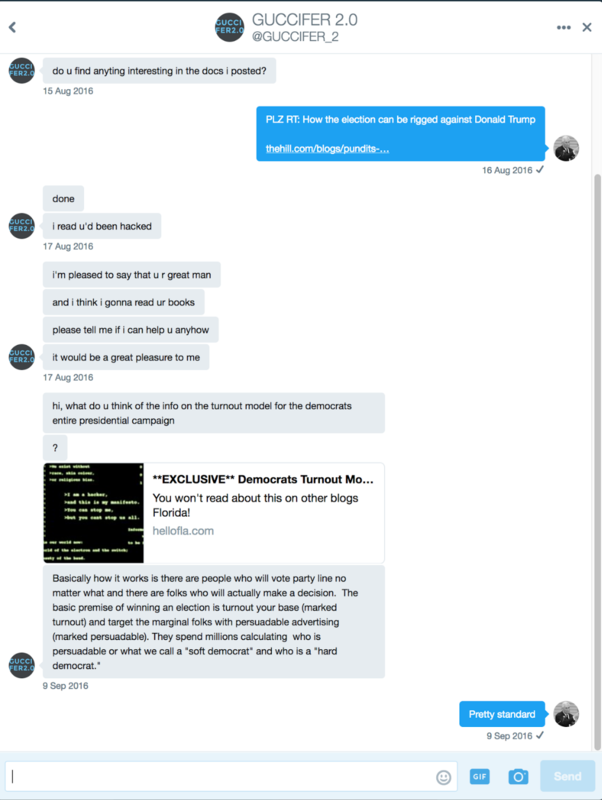 "That article came after the DNC and DCCC material had been released and identified the role of a hacker going by the moniker Crucifer 2 based on our own sources." 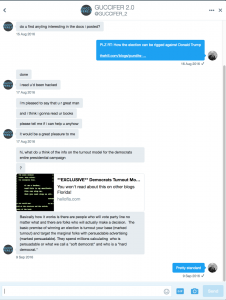 Stone said that his exchange with Guccifer happened "long after Guccifer's bit part in this drama," starting when he noticed "on Aug. 14 — some 10 days later" that the once-suspended Gruccifer 2.0 account had been reinstated. "I did in fact have a short and innocuous Direct Message Exchange with Guccifer 2.0," Stone writes. "It was so perfunctory, brief and banal I had forgotten it." He attached the exchange, which Salon has republished here. "Therefore, any such 'collaboration' would've also involved a time machine – something that I think Putin has not perfected yet," Stone concluded. Salon also reached out to William Bastone of The Smoking Gun, who didn't hold back on his position that Stone lacks credibility. "He's actually probably proud of it," Bastone said. "He's led a career filled with lies and I don't know why anyone would believe any account that he would offer now." Bastone added, "One of the talents he has is he gathers up information and twists it in certain ways. Where he runs into problems is when he is confronted by people who follow the fact pattern and follow the paper trail and don't get obstructed by his various obfuscations." When it comes to Stone's complaints about The Smoking Gun's story, Bastone simply said, "I tried to talk to him literally for months about this subject and he ducked for months. Only when we told him, 'We're going to run this story, talk about it now or it's running,' then he forked over the handful of quotes that he gave."